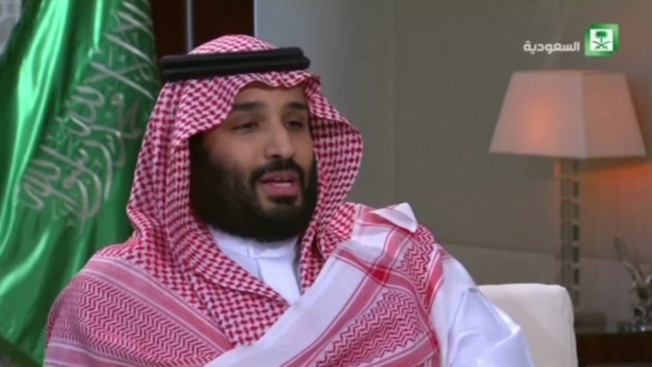 "It could very well be that the crown prince had knowledge" of Jamal Khashoggi's killing, adding "Maybe he did and maybe he didn't!" President Donald Trump has declared he will not further punish Saudi Arabia for the killing of U.S.-based columnist Jamal Khashoggi, making clear in an exclamation-filled statement that the benefits of good relations with the kingdom outweigh the possibility its crown prince ordered the killing. The president condemned the brutal slaying of Khashoggi inside the Saudi consulate in Istanbul as a "horrible crime ... that our country does not condone." But he rejected calls by many in Congress, including members of his own party, for a tougher response, and he dismissed reports from U.S. intelligence agencies that Crown Prince Mohammed bin Salman must have at least known about such an audacious and intricate plot. "It could very well be that the crown prince had knowledge of this tragic event," the president said Tuesday. "Maybe he did and maybe he didn't!" Asked about any personal financial involvement, he said: "Saudi Arabia has nothing to do with me. What does have to do with me is putting America first." The CIA had no comment on the president's statement. However, former Director John Brennan, a frequent Trump critic, tweeted: "Since Mr. Trump excels in dishonesty, it is now up to members of Congress to obtain & declassify the CIA findings on Jamal Khashoggi's death. No one in Saudi Arabia — most especially the Crown Prince —should escape accountability for such a heinous act."